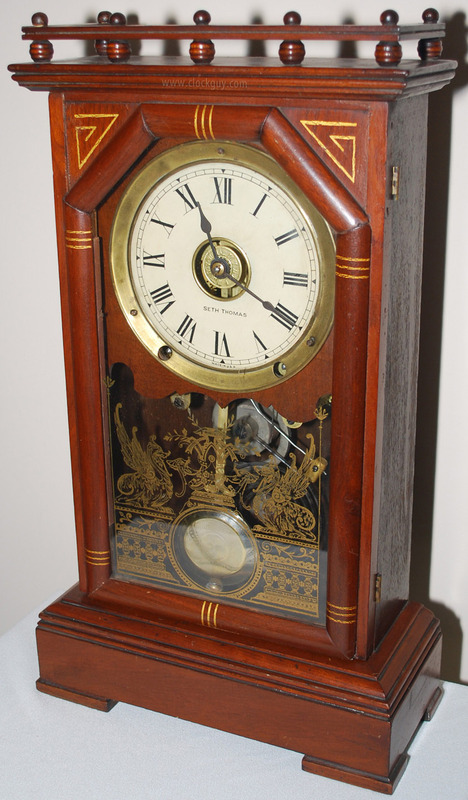 Seth Thomas City Series - Antique Clocks Guy: Antique Clocks and Mechanical Musical Instruments. We bring collectors and buyers together. Always the highest quality antique clocks available; fabulous antique automatic musical instruments. Seth Thomas City Series "Omaha"
Giving proper names to clock models was a common practice of most major clock manufacturing firms by the 1880s. One firm named many models after opera singers, another firm often used classical names, but one of the best known are the Seth Thomas models which were named after American cities. Various models were produced over a 40-year period, so it is doubtful that company actually considered them all a 'series', but the name “City Series” has been coined by collectors. Some collectors have padded the “City Series” with many models that were not intended to be named after cities. Armed with a good gazetteer, one could find a remote town somewhere in the world for nearly any model name. Models such as Victoria, Lincoln, and Garfield, even though not names of American cities, were, no doubt, named after the English Queen and the American Presidents, not the cities. There is also a 'College Series' with names like 'Cornell', 'New York', 'Cambridge', etc., but the company named these models after the colleges, not the cities. Some would claim some Seth Thomas cabinet-style models which are named for foreign cities (Milan, Cordova, Genoa, Seville, Mentone, Naples, Lisbon) are part of the 'City Series'. A purist would disagree because these are not American city names." Do you have a clock to sell? We'll sell it for you! Are you seeking a clock? We'll find it for you! founded on the "3 Rs"